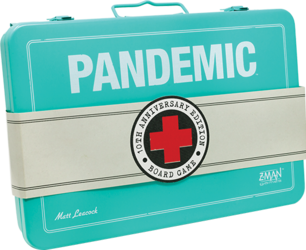 Z-Man Games is proud to present this special edition of Pandemic to celebrate the 10th anniversary of the first release of the game. This beautiful edition includes: A metal box, inspired by vintage first aid kits, A brand new design of a classic aesthetic, Plastic miniatures representing each character, Wooden cubes and markers, in tribute to the first edition of the game, petri dishes, tray and large format ID cards, for a totally immersive gaming experience. Come celebrate with us a decade of intensive care!